We eat a lot of bread at the Apartment Prepper household so one of the first “self sufficiency” skills I tried out was making your own Artisan Bread. I had a pretty good result with the making my bread from scratch but continued to buy packaged bread for sandwiches. First, a story from the past. I actually had a bread machine years ago, in my “pre-prepping” days. But I didn’t have the right mindset, and always felt that store bought was better. When I actually tried making a loaf, I did not read the instructions carefully and used a recipe that was not created for bread machines. The recipe was too much for the machine’s capacity. Some of the liquid ingredients of the dough overflowed out of the pan, short circuiting the unit. I decided the bread machine wasn’t for me. You cannot beat the convenience of having fresh bread anytime you like. Because most machines can be pre-programmed, I can have a fresh bread ready for dinner after a long day at work. The money savings is fantastic. Fresh bread ingredients are inexpensive and you will see a reduction in your budget. 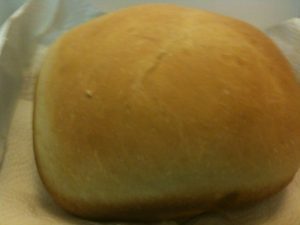 Also, fresh bread gives a cheap meal such as soup or pasta, a special touch so you will find yourself eating out less. Smells and tastes good. Once you find the recipes that work for you, the bread is very tasty and the whole house smells good. Uses counterspace. Before purchasing the bread machine, I got rid of a couple of appliances such as a George Foreman grill and the blender to free up space for the bread machine. No preservatives equals less shelf life. I know having no preservatives sounds more of an advantage, but because your homemade bread does not contain preservatives, it generally stays fresh only about three days at the most. If you keep it longer, it will get moldy very quickly. Dependent upon electricity. If the power grid goes down, the machine is useless. However, if you have learned to make bread from scratch, then you can always fall back on those skills should you need to. Shop around before you buy. New bread machines cost between $90 to $150 but you can find nearly new ones on Craigslist for around $15 to $25. Most of the advertised bread machines in my area are either new or used only once; most of them still have the original packaging and manuals. You need to be precise in measuring all ingredients in the bread machine. Read the manual and follow all instructions to the letter. Experiment with various recipes. I tried the recipe in Survival Woman’s article and it turned out great. I also found good recipes in the Cuisinart website that also earned rave reviews. 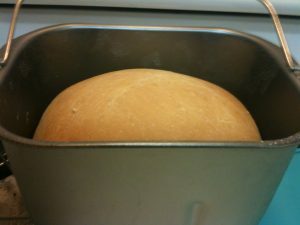 Add warm water to the bread machine pan. Add the sugar into the water and mix well. Add the yeast and it will bubble up. Add the flour, and finally the salt. Set the bread machine to a 1.5 pound loaf, medium crust, at the Basic Bread setting. Mine usually takes a little over three hours to complete. When ready, take out the bread and serve. This bread stays fresh about three days at the most. We do love our bread! Thanks for kudos. My latest adventure has been with homemade pizza which is oh so good . You can use dough from the bread machine for your crust – works great. Hmmm pizza. That’s great it works for pizza dough too! That’ll be the next project. Who has homemade bread in their house last for 3 days? Lol. Lol, it’s rare, but it happened when I made 2 loaves. The best way to keep the bread fresh is to slice it once it’s cool, and then freeze the bread in airtight packages of 2-3 slices. Take them out as needed. Bread thaws quickly, and there is little loss of quality even over several weeks.